Use our groundbreaking self-serve quoting widget! Install it directly on your website with a simple copy & paste, or place a link to it. Our widget allows your customers to input their basic information, with option to measure their property themselves using our easy to use measuring tool, and then review all your service offerings and pricing based on their measurements. Customers can then add services to their cart and select one of any check-out options you allow. Wake up in the morning to multiple, fully formed quotes that your customers did themselves. Now that's revolutionary! Our quoting widget is highly customizable, with measurement options, check-out options, tax calculation and detection, advanced notifications and much more. Even if the customer doesn't fully finalize their quote through the widget, we still store all the customer's basic contact information for you to review. This allows you to proactively follow up with engaged customers and close more sales. When your customers measure their property for a quote, you get to view exactly what they measured, so you will be able to tell if it was performed correctly. Add our standard lead form to your website and collect customer information and receive notifications instantly. The lead form is hooked up to your service offerings automatically so your customers will be able to select which services and add-ons they are interested in. All the lead information is saved to your account to follow up with later. With a click of a button you can instantly import the lead information into a quote, based on what the customer was interested in and have it delivered to their inbox. Keep in contact with your contacts! Use our super simple email marketing feature to schedule and send emails to your customer lists. Schedule them in advance and track all performance via our reporting. Gain insights about your customers and increase communication. Your public profile page is your own personal page to promote your business to potential customers, gather leads and close sales. Think of it as a mini website page you can use to self-promote yourself as well as tie all your Projectquoting.com services and features to automatically. This makes it easy to keep your marketing, lead generation and proactive quoting, invoicing and other features all in one place. 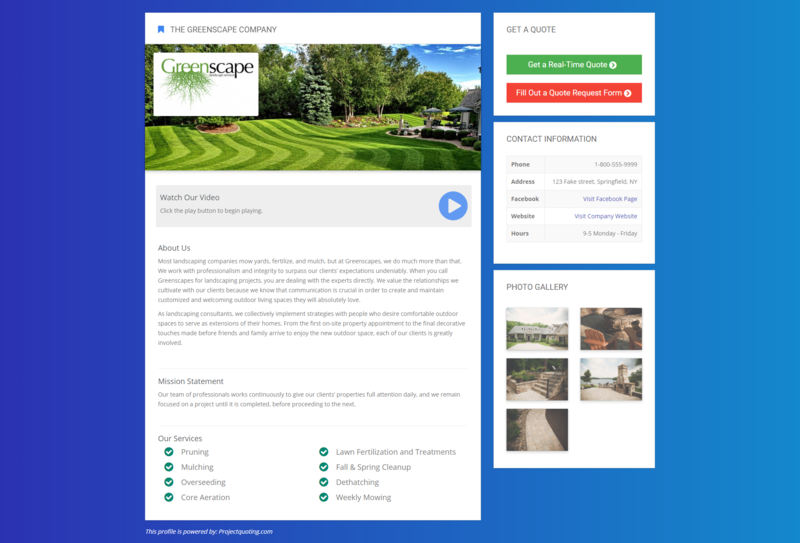 Add your business description, mission statement, and more. Display all your contact info and business hours. Have your Lead form and/or real-time quoting widget automatically integrated. Show what services you offer to your customers. Customize your profile's cover page. Add up to 10 photos to your photo gallery. Fully responsive, works and looks great on any device or screen. Enable or disable your profile from being public at any time. And more features to come!